Most of the people of Japan are descendants of immigrants from the Asian mainland in around 300AD. A small group of the indigenous population (the Ainus) remain - mainly on Hokkaido. Much of the culture of Japan has been adapted from that of China, although it has also been greatly influenced by Western countries over the past century. Japanese society is extremely homogeneous with non-Japanese people (mainly Chinese and Koreans) accounting for only around one percent of the population. Other ethnic groups represented are from the Philippines and Brazilians of Japanese decent make up 5-10% of the population in some industrial towns. The family is the basic unit of society and respect for the elders is of great importance. The group is regarded as more important than the individual, and social hierarchy is more strictly observed than in the West, with respect and deference shown to older and more senior people. Education is extremely highly valued in Japanese society, and academic achievement is held in great esteem. The importance of hard work and perseverance is instilled into Japanese children from an early age and this remains a fundamental belief throughout adulthood. The concept of "face" pays a part in relationships. Much of the behaviour adopted by the Japanese is based on making sure that no one loses face. The Japanese tend to be more formal and polite and less physical and personal in their everyday dealing than "westerners". To avoid losing face the Japanese rarely say "no" directly, nor ask a direct question or give a direct order. Equally, "yes" may not always mean they agree. It is considered respectful to add the suffix "san" to someone's name, and especially respectful to add "sama"
There are thousands of hot volcanic springs (onsens) in Japan which are visited by many Japanese people to relax and socialise. The emphasis is on providing an environment for contemplation rather than washing. Bathing etiquette is of great significance in Japan. The water must remain as clean and pure as possible, so showering is essential before entering the onsen. As nothing is allowed in the water but the bathers themselves, swimsuits are not worn and the bathers are given a small white towel, which is either placed by the side of the bath or worn on the top of the bather's head. Japanese is spoken almost exclusively within Japan, although it is rarely spoken in any other countries. Although there are many regional dialects spoken, there is a standard version of the language called hy?jungo. The Japanese language has few sounds compared to many other languages. Written Japanese combines three scripts - hiragana (similar to the Chinese cursive script), katakana (derived from Chinese characters) and kanji (also imported from China). Both Japanese style (vertical columns from right to left) and Western style (horizontal rows from left to right) methods of writing are used. English is taught in schools and statistics state that over 15 million people in Japan speak the language to some extent. In large cities there is some signage in English and some restaurant menus are written in both languages. Religion Religion does not play a big part in the lives of most Japanese people, although religious customs and rituals are practiced on special occasions and religious holidays. 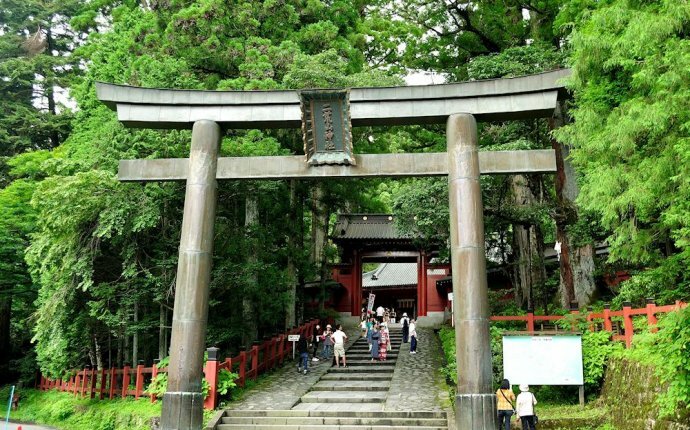 The two main religions that are practiced in Japan are Shintoism and Buddhism, or a mixture of the two. Japanese religion is rarely preached but seen as a moral code in the way to live life. Religion is usually a private, family affair with no religious symbols or practices in schools. @Vienna Watarai: I'm too much into japanese culture. At the Greek restaurant I said "Entschuldigung!" and raised my hand like the Japanese with "Sumimasen!"